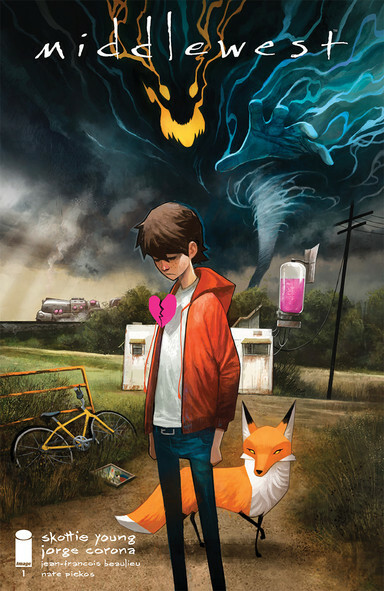 Middlewest is a new ongoing series from writer Scottie Young and artist Jorge Corona. It’s about life in a small town, the town you grew up in, and can’t wait to get out of. It’s also about the inner demons you must face and come to terms with. Abel lives in a trailer park with his father. Not much is known about his life, except for the fact that his mother left them and he now is stuck living here. With help from a talking fox and his friends, Able is making the best life he can in this place. In the Middlewest. Where the wind is violent, and sometimes he thinks that it will take him away from here. But there is something else in the wind, something that he is trying to avoid desperately, but might also be a part of him. The relationship between able and his father seems to be the heart of the story. His father isn’t the nicest guy in the world, but I get the sense that there is something more at play that what we see. From the brief glimpses we get of them together, his father is either abusive, just wants what best for his son, or is driven by something else entirely, I think it’s the later. I’m sure we will find out more as the series progresses. The other characters in Abel’s life are great, but they seem to get him into trouble a lot, especially with his father. This is a great start to a new series. The first issue does a great job setting up the world. The artwork is beautiful, every panel like a painting and the story is intriguing. I look forward to seeing the further adventures of Abel in the Middlewest.